“Report of Lieut. Colonel Marsh B. Taylor. Chattanooga. Tenn., December 1, 1863. Sir: I have the honor of making herewith my ofﬁcial report of the late battle. On the morning of the 23rd of November, 1863, I received orders to hold my Command in readiness to move at a moment’s notice, with two days’ rations and 100 rounds of cartridges to the man. About 4 p. m. I joined the brigade in front of Fort Negley, and closed en masse, my position being in reserve with the Fourteenth Ohio, the Tenth Kentucky, Fourth Kentucky. Thiry-eighth Ohio and Seventy-fourth Indiana being in the advance. We remained in this position until the morning of the 24th when the brigade was ordered to the left and front. After formng our line of battle, pickets were posted and remained until relieved on the morning of the 25th. Immediately the four left companies were ordered out as skirmishers, but were soon withdrawn. We were then ordered to the left next to the river and marching and counter-marching we were formed in line of battle about 2 p. m., my regiment being in reserve of the brigade with the Fourteenth Ohio. After remaining in this position about two hours, we were ordered forward to storm the ridge, and in so doing were exposed to a raking ﬁre from commanding positions on the top of the ridge. We succeeded in taking the ridge. My command lost 11 wounded. We remained in this position until next morning, November 26, when we were ordered to Ringgold, Ga. The officers and men of the regiment behaved with great gallantry. The 150th Indiana Infantry Regiment served from March 9- August 5, 1865. Like the distant chiming of vesper bells, which recalls us to our God, or like the booming sound of the far off minute gun at sea, reminding us of enternity, (sic) comes to us from a distant hamlet in Texas the sad news of a comrade’s death. One who stood dauntless and brave amidst the bravest; one who has laughed at death upon a dozen battle fields, but who wept like a child at the bed-side of a dying comrade, has gasped his life away at last. 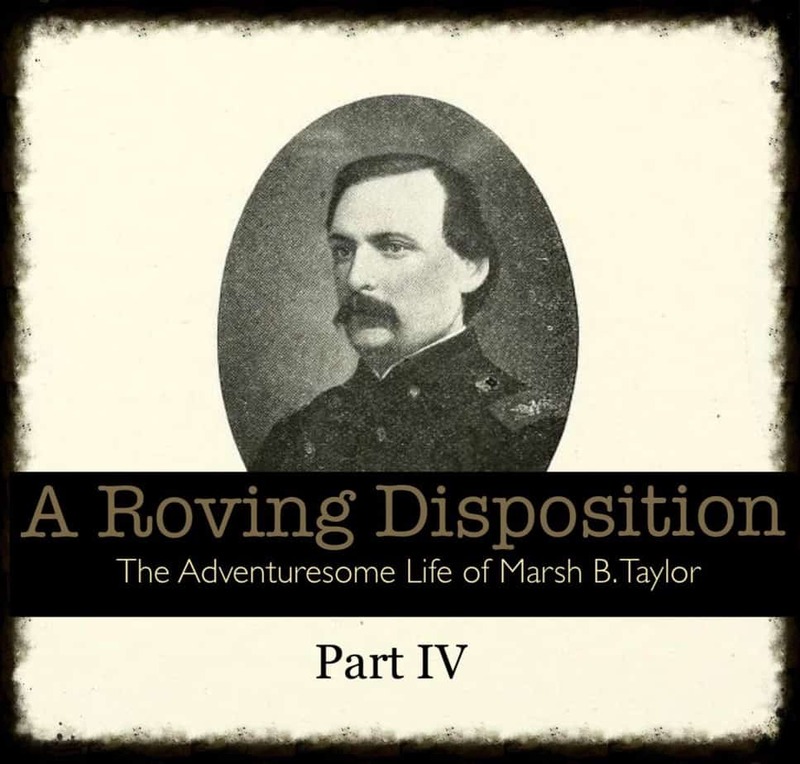 Colonel Marsh B Taylor died at Hegansport, Texas on July 20th. These are cold, calm words, but they fall like clods upon a coffin lid. Before all the world we are proud to say: that man was our friend! and our strong, warm love for him shall be a shield behind which all his faults can hide. He was our Captain, then our Colonel always our friend, and in his friendships he never faltered. We have heard his cheery laugh in the camp and followed his ringing commands upon the battle-field. We have slept under the same blanket and shared the same haversack and never knew a warmer-hearted or a braver man. Among the most successful soldier reunions yet held was that at Lebanon. Lieut. Marsh B. Taylor. Shaw, James Birney. History of the Tenth Regiment Indiana Volunteer Infantry: Three Months and Three Years Organizations. Lafayette, Indiana: 1912. Accessed on 25 November 2015 at ­https­://­archive­.­org­/­stream­/­historyoftenthre00inshaw­. Also accessed on 25 November 2015 at ­https­://­books­.­google­.­com­/­books­?­id­=­7K1xAAAAMAAJ­&­num­=­9­. Page 123. 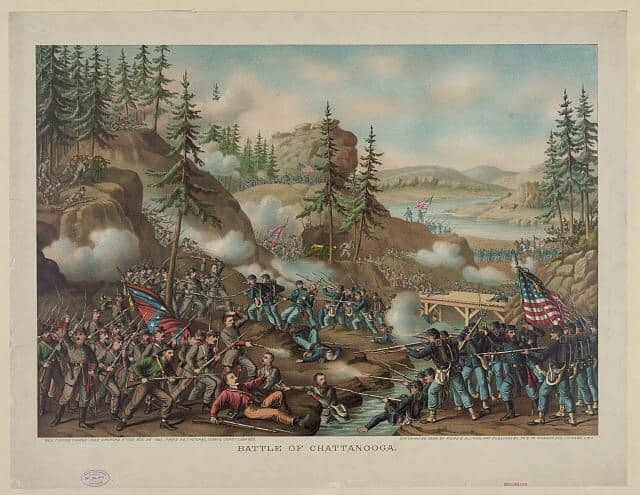 Battle of Chattanooga–Gen. Thomas’ charge near Orchard Knob, Nov. 24′ 1863–parts A.O.T. Potomac, Tenne. & Cumbd. engaged. Kurz & Allison. c1888. Library of Congress Prints and Photographs Division Washington, D.C. 20540 USA. Catalog Number 91482116. Accessed at loc.gov on 3 January 2016. “Battle of Chickamauga”. Wikipedia. https://en.m.wikipedia.org/wiki/Battle_of_Chickamauga. Accessed on 2 January 2016.
 Letters Received by the Commission of the Adjutant General’s Office, 1863-1870. NARA Publication M1064. Marsh B. Taylor. 10 November 1863. File Number T266. State: Tennessee. Original data from The National Archives. Accessed at Fold3.com (https://www.fold3.com/image/304774024) on 30 December 2015. “Kentucky, County Marriages, 1797-1954,” index and images, FamilySearch ‎(­https­://­familysearch­.­org­/­pal­:/­MM9­.­1­.­1­/­V657­-­T7N­ : accessed 19 Oct 2014)‎, M. B. Taylor and Susan Bishop, 29 Nov 1864; citing p. , Nelson, Kentucky, United States, Madison County Courthouse, Richmond; FHL microfilm 000481488. “Kentucky, County Marriages, 1797-1954,” database with images, FamilySearch ‎(https://familysearch.org/ark:/61903/1:1:V5PF-8N6 : accessed 28 December 2015)‎, M B Taylor and Sudie W Bishop, 29 Nov 1864; citing p. 436, Nelson, Kentucky, United States, Madison County Courthouse, Richmond; FHL microfilm 481,491. “Kentucky Marriages, 1785-1979,” database, FamilySearch ‎(https://familysearch.org/ark:/61903/1:1:FW1J-XQG : accessed 28 December 2015)‎, M. B. Taylor and Susan Bishop, 29 Nov 1864; citing Bardstown, Nelson, Kentucky, reference P525; FHL microfilm 1,929,414. Sarah Bishop household. US Census Year: 1870; Census Place: St Louis Ward 6, St Louis, Missouri; Roll: M593_816; Page: 173A; Image: 7; Family History Library Film: 552315. Source Information: Ancestry.com. 1870 United States Federal Census ‎[database on-line]‎. Provo, UT, USA: Ancestry.com Operations, Inc., 2009. Images reproduced by FamilySearch. Original data: 1870 U.S. census, population schedules. NARA microfilm publication M593, 1,761 rolls. Washington, D.C.: National Archives and Records Administration, n.d. Minnesota census schedules for 1870. NARA microfilm publication T132, 13 rolls. Washington, D.C.: National Archives and Records Administration, n.d.
 A Hero’s Last Sleep.” Madison Dollar Weekly Star (Madison, Indiana). 5 August 1879. Accessed at newspaperarchive.com via myheritage.com on 30 December 2015. Sarah Bishop household. U.S. Census, Year: 1880; Census Place: Chicago, Cook, Illinois; Roll: 194; Family History Film: 1254194; Page: 204D; Enumeration District: 117; Image: 0150. Ancestry.com and The Church of Jesus Christ of Latter-day Saints. 1880 United States Federal Census[database on-line]. Provo, UT, USA: Ancestry.com Operations Inc, 2010. 1880 U.S. Census Index provided by The Church of Jesus Christ of Latter-day Saints. Original data: Tenth Census of the United States, 1880. (NARA microfilm publication T9, 1,454 rolls). Records of the Bureau of the Census, Record Group 29. National Archives, Washington, D.C.
 “An Affecting Scene.” The Elyria Republican. ‎(Elyria, Ohio)‎. Thursday, October 30, 1879. Page 3. Accessed at newspapers.com on 24 November 2015.